Last week around 3:00 AM I got an amazing view of a lineup of five stellar wonders taking up what looked like 100-degrees of the sky: Sirius, Orion’s Belt, Aldebaran, the Hyades, and the Pleiades. This dramatic alignment was also available to our ancient ancestors, who no doubt tracked its progression across the sky and interpreted it as best they could. One of these interpretations was painted on the walls of Lascaux Cave in France more than fifteen thousand years ago. Before looking at that extraordinary painting, let’s examine all five asterisms from a contemporary perspective. Working from left to right, the first element in the alignment is Sirius, the brightest star in our night sky, also known as the Dog Star. Next come Alnitak, Alnilam, and Mintaka, the three stars that make up one of the most easily identifiable of all star groups, Orion’s Belt. Orion’s Belt is followed by the red-orange supergiant Aldebaran. From our point of view on Earth, Aldebaran is positioned directly in front of an open star cluster called the Hyades, making them look like a single unit (Aldebaran is actually around 75 million light years closer to us than the Hyades). And finally — last but not least — the Pleiades, a small cluster of young blue stars that are one of the most beautiful sights in the night sky. Now on to the Stone Age Lascaux cave painting. It’s situated on a high ceiling of the cave in a pitch-black area known as the Hall of the Bulls. A scaffolding system and lit torches were required to create the painting. There are many depictions of bulls here, but the one that concerns us has an eye that appears to represent Aldebaran and the Hyades. This correlation is supported by the tips of the bull’s horns, which match up exactly with the positions of the stars Beta Tauri and Zeta Tauri. Remarkably, this is the same layout we reference today as the constellation Taurus (Taurus is Latin for Bull). Over the bull’s shoulder are six black dots in the correct position and distribution as the stars that make up the Pleiades. And to complete the picture, there’s a row of dots in front of the bull in the correct position for Orion’s Belt. With all these data points, it’s unlikely the connection between the painting and the stars is purely coincidental. However there’s one significant anomaly. 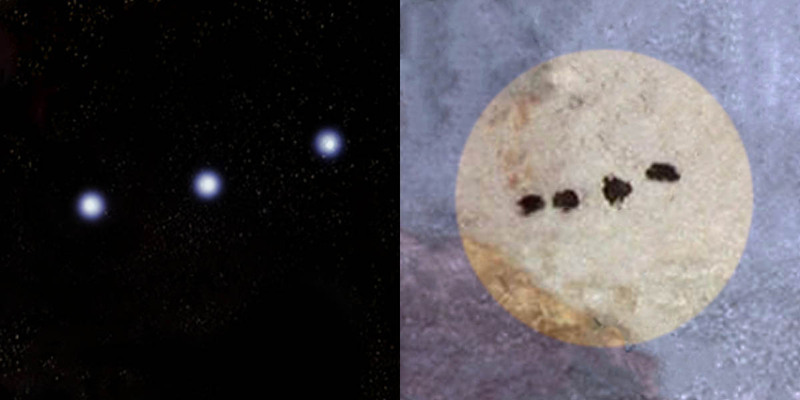 Orion’s Belt consists of three stars, but the painting shows four. What does the extra star represent? Perhaps a celestial event such as a supernova explosion occurred in that location. That would have gotten everyone’s attention. Or maybe it represents an observation of Halley’s Comet, the parent of the Orionid meteor showers, that cruises by there every seventy-five years or so. That must have made a pretty big impression too. Another possibility is that the extra star is an element from a prehistoric myth. One puzzle piece that supports this idea is our magnificent bull painting that matches up with the constellation Taurus. If we assume the correlation’s correct, it means this cosmological symbol has been in place in the Western world for at least the better part of twenty thousand years. The Orion Constellation likewise has had mythological continuity for thousands of years across many cultures in the form of an anthropomorphic celestial figure, including Babylon (Anu the Heavenly Shepherd), Egypt (the god Sah), Arabia (Al-jabbar the giant), Greece (Orion the Hunter), and Siberia (another hunter), to name just a few. From this perspective we might extrapolate that Sky Bull and Sky Man are key players in a lost cosmic story, for which the fourth Star Dot may be the missing link. I doubt we’ll ever unravel that story. But my sense is that it’s been passed down from generation to generation in various forms for a very long time. Perhaps it’s still with us today, hiding in plain sight.